Just flicking through the earlier outputs and i can't anything untoward lurking in the woodshed. It is starting to look more like proper Autumn though now.Not yet the really stormy side of the season but over the next week or so a gradual move south of the polar front with colder air more involved for the UK.The balmy and mild southerlies seem to be off the menu for now as we see the affects of the expanding Greenland trough sending the jet into our locale. 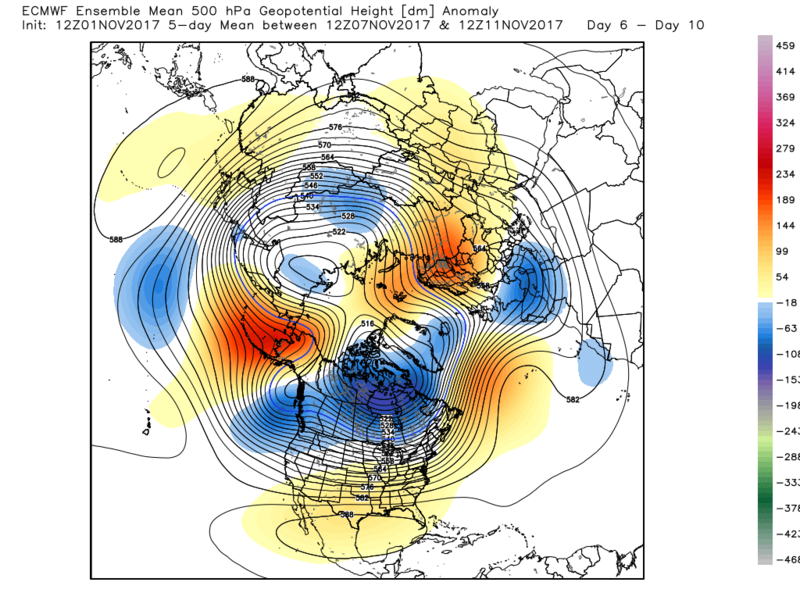 We seem to be looking at a rather changeable west to east flow,with switching between something colder before we see a return to more normal temperatures before the next fronts approach.This rather mobile pattern looks set to continue into week 2 although this could be tempered somewhat by any expansive ridging from the Azores high, especially further south. As an aside a number of the gef stamps for day 10 show such a scenario, even linking up with heights further ne. currently a minority solution but with the ECM suite also toying with +ve ht anomalies in these areas maybe something of interest down the line.and whilst we are waiting to see if Zonal winds show their usual pick up by late November. 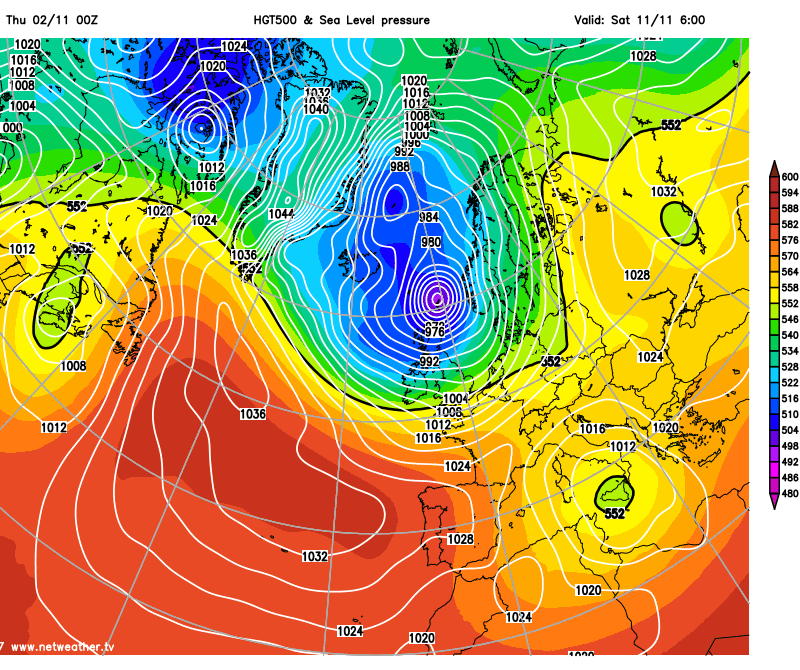 the fronts more active further north at present gradually easing south by the weekend. Showing the dip in temperatures and step up in rainfall around the 4/5th Nov as the colder air comes south.  Whilst the current extended output is not without interest, it is too early to be over analysing it from a coldie perspective. 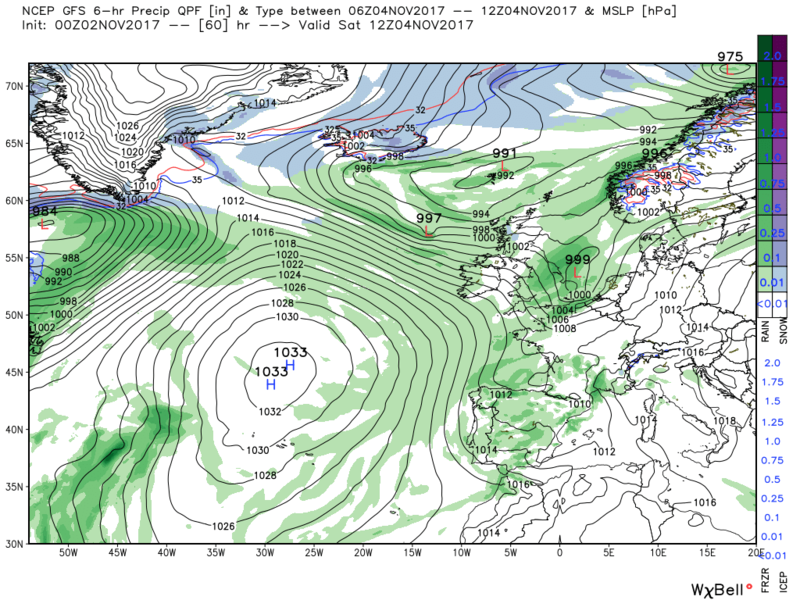 I would observe that a continued shallow mean trough over Europe to our south keeps us 'on standby' as we approach winter proper. The UKMO 12Z run has a stronger jet running through the UK as we head into the medium range than the GFS does but both models do have a similar overall pattern but they are probably not all that far off from what the ECM is sho really but as been mentioned before, the ECM models has an over amplification bias which gets more noticetable as it goes further on in the output. 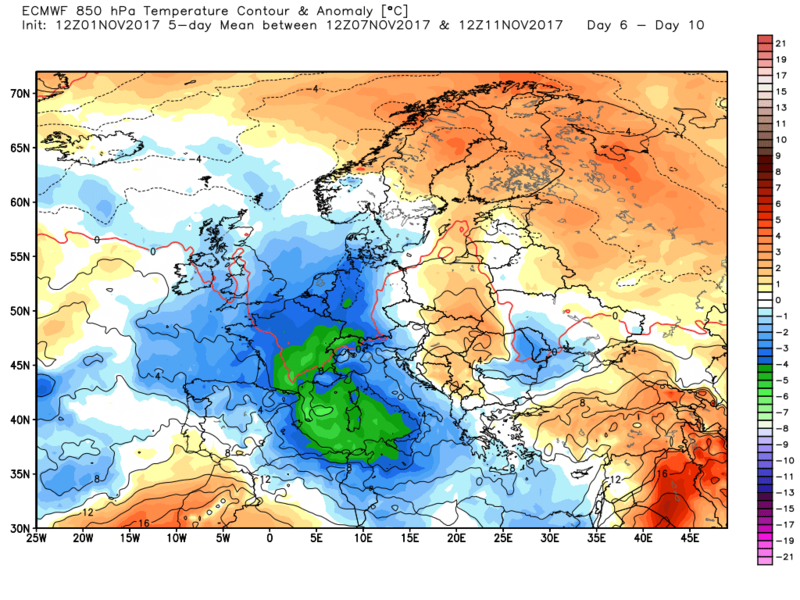 For now, I would rather take the UKMO output because of the season we are in, an easterly does not appeal to me at the moment especially as any cold air looks quite weak and the Arctic is not forecast to have a particularly strong PV developing anytime soon. Looking forward to a chilly weekend, hopefully that ripple in the weather front clears quickly on Saturday so everyone is in that clean fresh polar air with frost and perhaps fog more of a potential going into Sunday night. 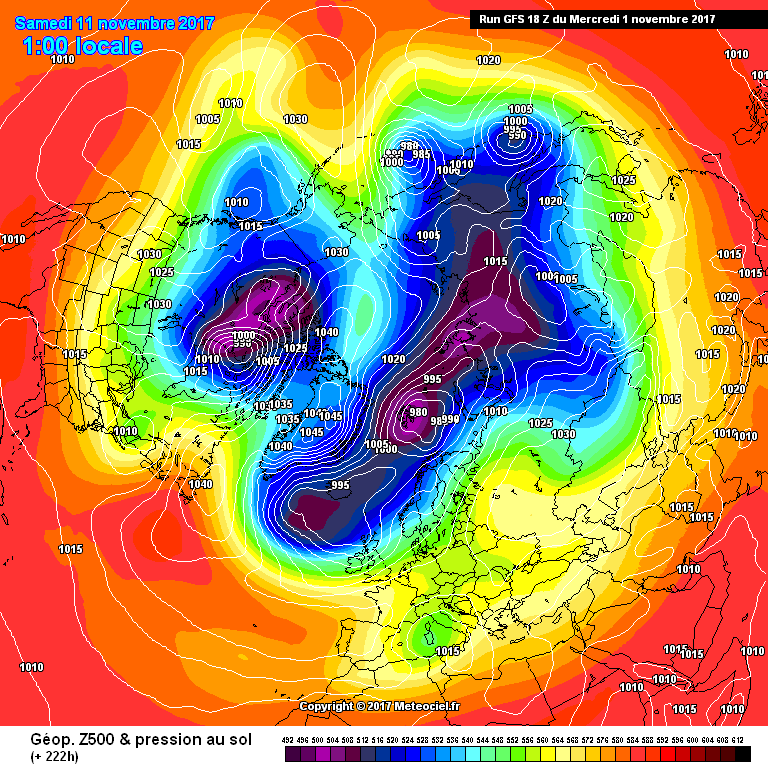 The ecm develops a strong block to our east with some quite serious cold pooling over western Russia. Will we be able to tap into this in a few weeks time I wonder. Nice to see it building. It means we have a ticket at least. Thanks for that MWB! 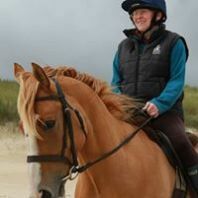 Amazing what you can learn on this fantastic forum! 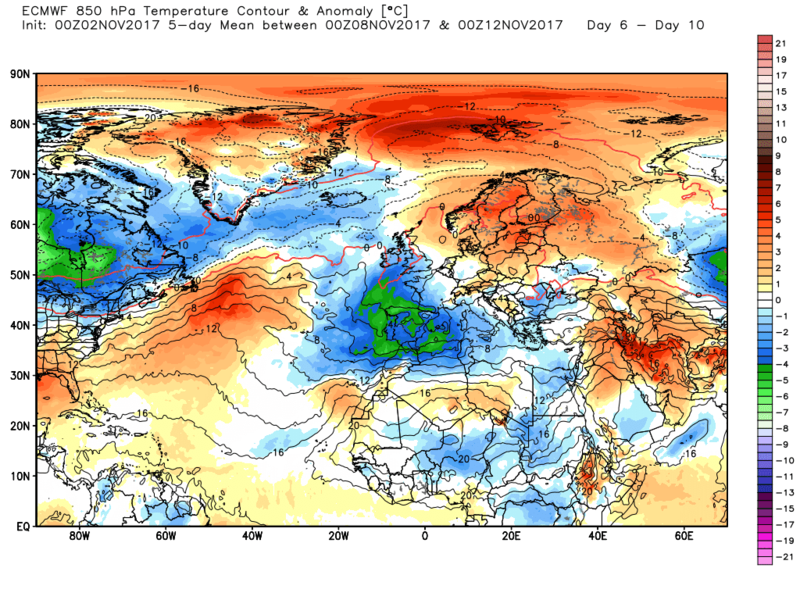 That trend to send colder air and lower pressure into S Europe is gaining speed. Doesn't mean anything at the moment but it is a potential building block towards High Pressure to its north. I'm tempted to trust the models more on this - I feel verification of this type of scenario is better than the N Atlantic heights one. The anomalies this evening are not without interest. 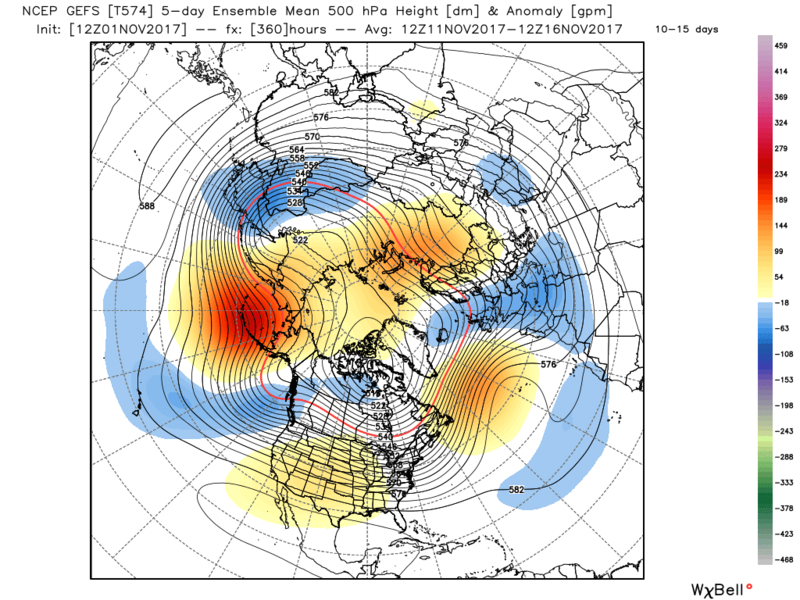 Upstream perhaps some intensification of the vortex N. Canada and slight realignment of the associated trough SE to the UK which is also equated with the renewed amplification in NW Europe and the eastern Atlantic. 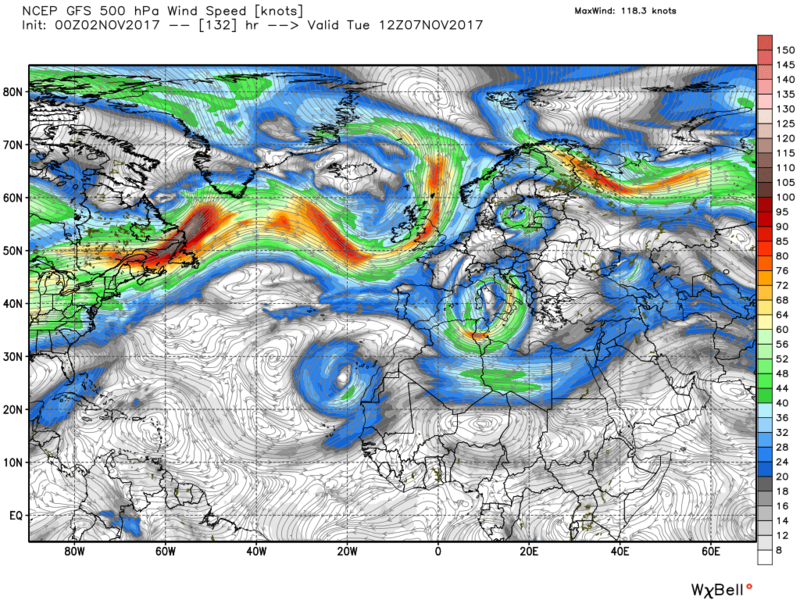 Thus we have stronger Scandinavian ridging and the trough digging further south to the low pressure in the Mediterranean region. 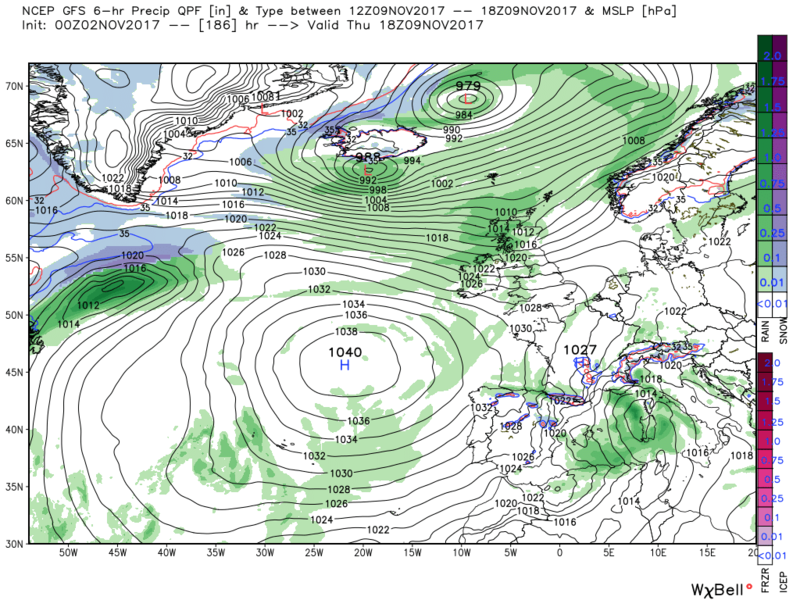 This emphasises the weakening and split flow in the eastern Atlantic particularly if the Azores pushes north in mid Atlantic. This portends some interesting surface detail for the det runs to sort with any west-east movement restricted and a slack low pressure area to the south of the UK Not forgetting that energy is still winging east just to the north. 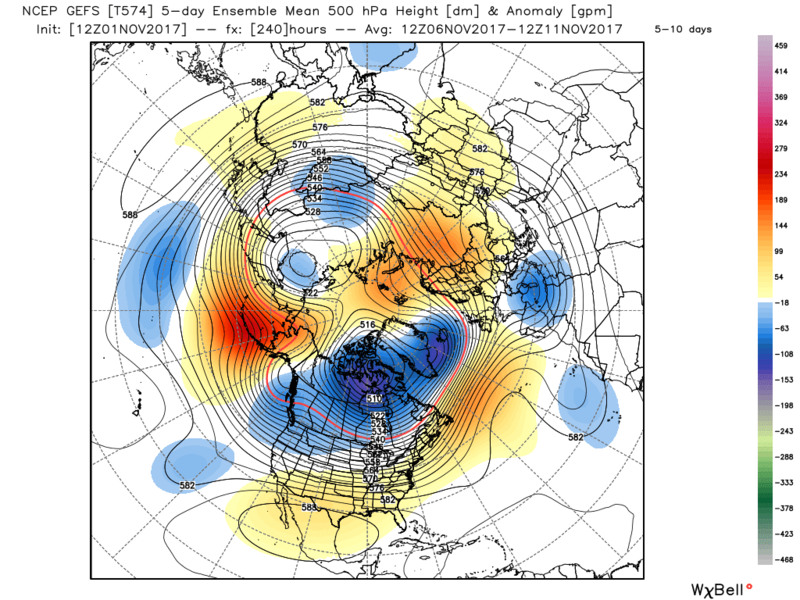 Quite a few ecm ensembles go cold in the 10 day plus range, especially the control run. Here we go again eh? Seems the silly season is starting to kick into gear. Prepare to be teased as usual - but it's about time something actually came off so here's hoping. It is best though not to set the bar too high, and just to enjoy the more entertaining charts as and when they come . It is true to say, though, that I have had one eyebrow inching upward at times today. Taking cursory glances at the models over the past week or so.. but now able to comment more.. Both ECM and GFS quite similiar in their output for the foreseeable future - a generally weak meridional mobile flow, with the jet taking a more NW-SE alignment, sending troughs on a NW-SE trajectory and locking most of the UK on the colder side of the jet more than on the milder side - so quite a change to conditions in October when we were firmly locked on the milder side. What this means is a rather seasonal feel to things, drier than normal, with frost and fog on the cards, and plenty of sunshine especially in the south - very pleasant overall despite temps probably coming in average at best in the south, a bit colder than normal in the north, Friday night may bring some heavy rain to central parts, but other than that frontal activity looks fairly weak away from the NW. Northern high ground likely to receive first dustings of snow of the season. 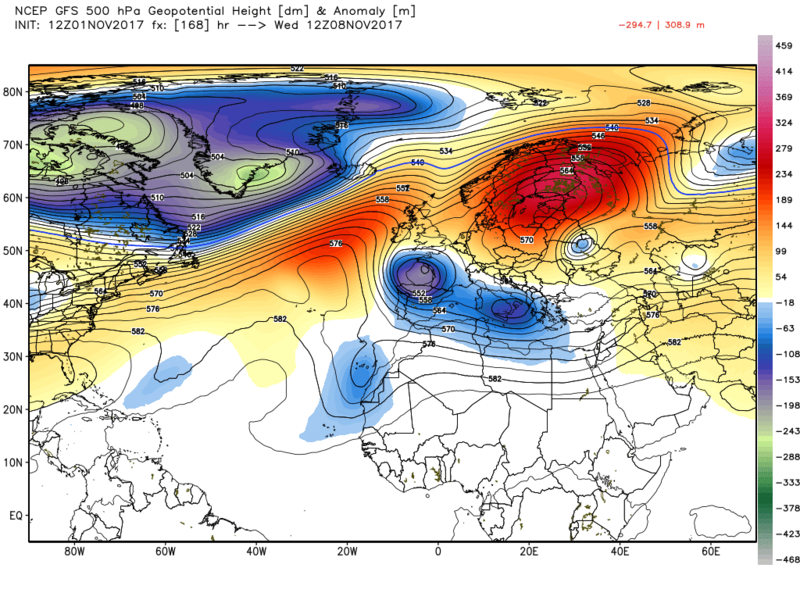 Longer term - ECM suggesting heights building to the NE, and lower pressure over southern Europe. Much will depend on how far the trough digs into Europe, but there are signs it wants to head SE as opposed to east towards scandi, which would help aid the ridging and building of heights west out of Russia. 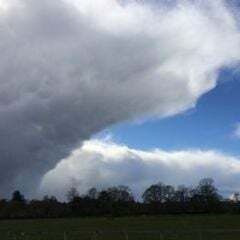 From a personal perspective, its a very pleasing outlook, November can be a grim wet damp dark month, but this year at least it looks like starting on a much drier sunnier and crisper note.. 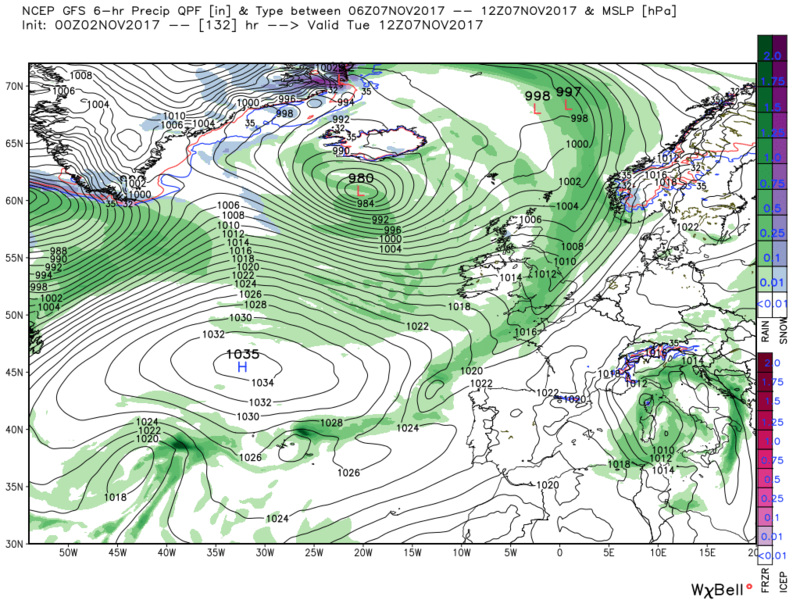 Interesting end to the gfs coming up. Early in the season for a pub run special ! Today will see a ridge of high pressure slide over the UK so generally a rather benign day but with some regional variations. Early morning for in many places in the south will slowly clear during the morning leaving a pleasant day. But a slow moving,weakening front, will mean cloud will linger in Wales and the Midlands with perhaps the odd spot of drizzle. Further north, and including N. Ireland and Scotland, a bright day but much cooler than in the south where it will be pleasant in the light winds. This theme continues to some extent over the next couple of days as the aforementioned fronts weaken and by 12 Friday the south is still in a slack gradient (a col) with the HP away to the SE and a low to the south west with the north still in a westerly flow from the trough to the north. 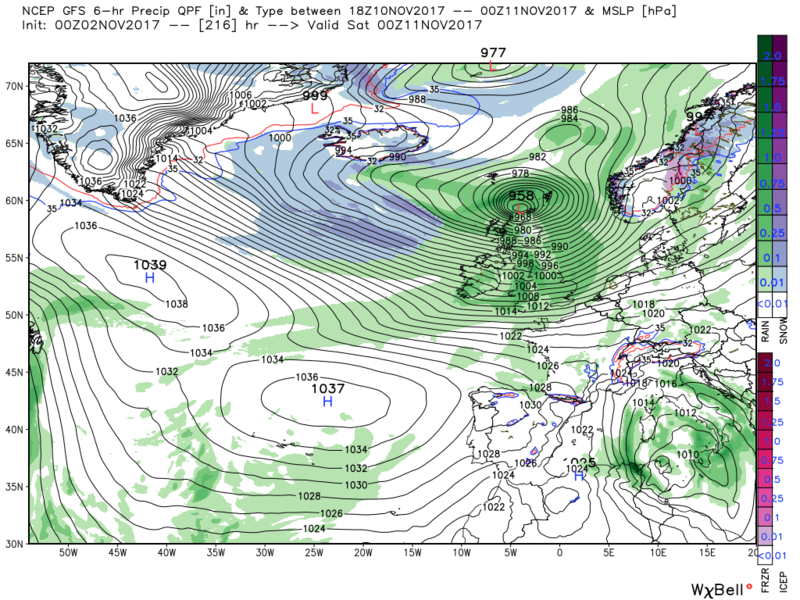 Over the next 48 hours the low intensifies and tracks north east into the North Sea and then into southern Norway bringing rain to England and Wales through Saturday and (oh my god) blizzards to Norway. Spot on. 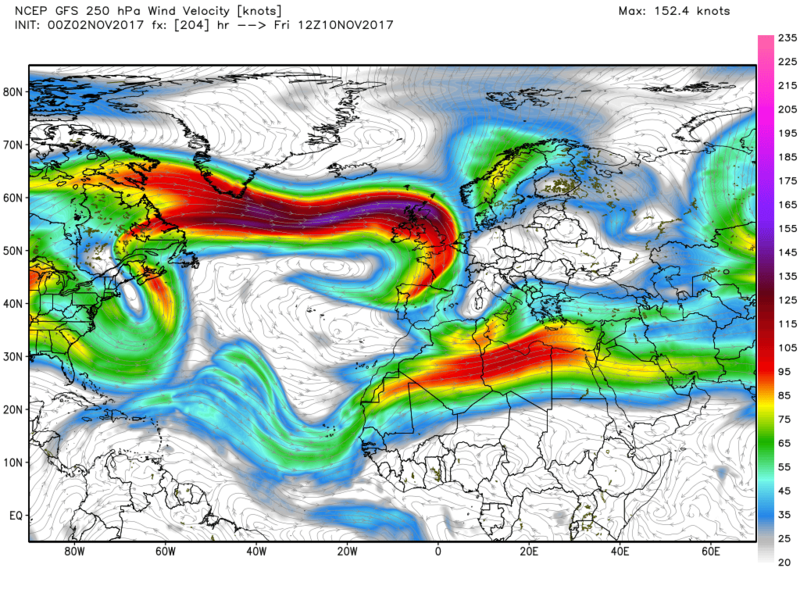 Explosive cyclogenesis on the 170kt jet which would bring heavy rain and severe gales to the UK. Fortunately this scenario is very unlikely to unfold but that does not exclude a watching brief of course. 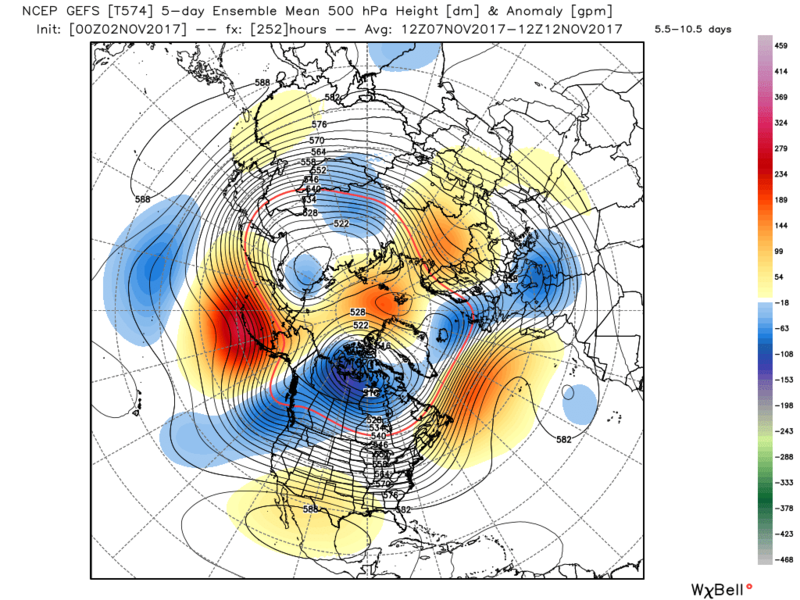 Leaving the cylogenesis aside a glance at this morning's GEFS anomalies indicates where the det run is coming from. A couple of the lower Strat charts for good measure. 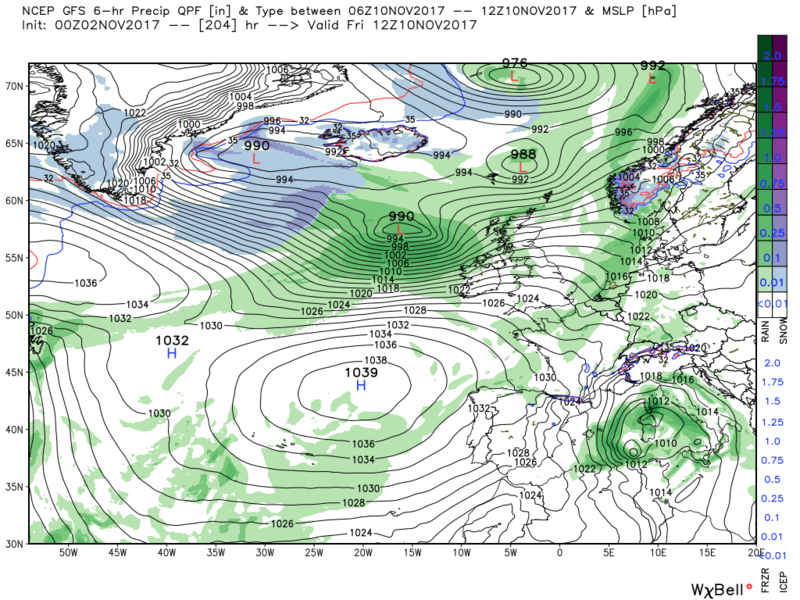 Yes saw that cyclonegenesis espisode on the GFS 0z chart this morning. 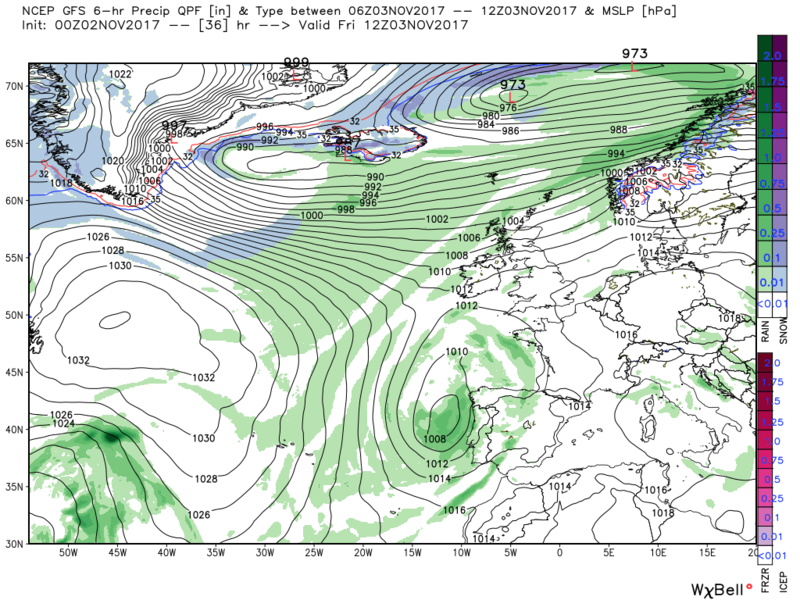 Given conditions in the atlantic I find it hard to believe it will happen. Last year or year before yes. Whats interesting is the creeping of colder NWly and Nly polar maritime air closer to our shores and into a more reliable timeframe. The ecm predictable is okay up to the middle of next week vis the gfs but thereafter ignores the Armageddon route thanks to the cut off upper low ti the south supporting the Azores ridging north east. Having said that energy/trough does eventually break down resistance. General dropping of the AO in week 2 to negative/neutral on recent ens runs now reflected in gefs going markedly negative. wonder if the eps and gems will follow this trend? I’ve seen worse November outputs! Azores high mainly displaced to the west and the PV not setting up shop to the north. Both the ECM and GFS are in good agreement on the overall pattern upto day ten which isn’t often the case so perhaps a bit more confidence that this will verify . The more uncertain aspect is whether we see enough upstream amplification and increase in heights towards the nw to deliver a bit more interest. Decent Scandy Low just over a week off. 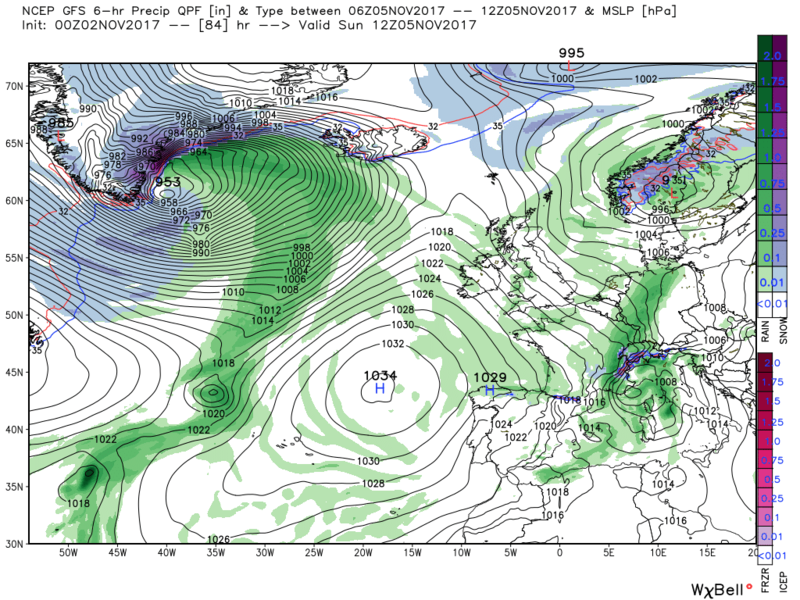 One of the problems with the set up consistently modelled by GFS is, as we've seen in previous winters, the Azores HP is displaced NE toward the SW approaches. The trough is aligned NW-SE but to the east of the British Isles so we get occasional incursions of PM sourced air but, to be fair, Europe and especially Eastern Europe gets colder. The HP is being pushed north by small ex-tropical shortwaves which move north toward the Azores. Occasionally, the HP tries to retrograde WNW but the strength of the jet prevents that and the HP quickly returns to its "home".